Who are the real winners and losers of the Qatar – Gulf Crisis? How will the crisis impact the future of the Horn of Africa region? The Golf Cooperation Council comprised of the United Arab Emirates, Bahrain, Saudi Arabia (SA), Oman, Qatar and Kuwait, and Yemen is facing dark moments in its history. Swiftly, Saudi Arabia, United Arab of Emirates, Egypt, Bahrain, Libya, Yemen, The Maldives and others cut ties and imposed embargos on Qatar. The Saudi led coalition is ordering Qatar to stop supporting terrorism, halt military cooperation with Turkey, shut down Al Jazeera and most importantly, cut ties with Iran. The total list of the demand is 13, however, the four are the key demands that Qatar must satisfy to rejoin the group. The implication of the fallout to the Middle East is unpredictable. However, to the countries in the Horn of Africa and Red Sea region namely, Yemen, Somalia, Djibouti, South Sudan, Sudan, Ethiopia, Egypt and Eritrea the reverberations will resonate. The fast-moving juxtaposition is reshaping the future-security, trade, bilateral and regional relations of these countries for some time. It is therefore, of utmost importance to take note of what these developments mean to all the countries in focus. These developments also point to a unique stage in world history. Since the end of World War II, and particularly after the fall of the Soviet Union which ended the cold war in 1991, the US dictated the agendas of the region. After the Arab Spring that rocked the leaders of the Mid-East; pseudo-human-rights agenda Obama administration pursued and, US nuclear agreement with Iran created a rift between the US, Saudi Arabia, Israel and others. US role in the Middle East became hazy and that made traditional US allies like Saudi Arabia nervous about US policy-pivot to Iran. This, in large part was the reason, for the first time, the Saudi’s and others were forced to carveout geopolitical agendas independent from US. The Saudis war against Yemeni Houthis is bi-product of the fallout. A coalition of eight Sunni Arab nations led by Saudi Arabia started bombing campaigns against Yemen allegedly to stop Shia Iran. This quasi-independent move by the Saudis has led to cascading set of events that will cement the geopolitical realities of the region for the foreseeable future. These developments demonstrate the beginning of departure from the unipolar US led regional agendas to multipolar regionally driven national interest based agendas. For the first time, countries in the region are making strategic decisions and alliances based on their national interest independent from US. The Saudis war in Yemen is ambitions effort to assert regional influence. The Saudis did not intend to break relations with the US. They just wanted to ensure their dominant role. To that end, the Saudis lobbied the Trump administration which coincidentally was eager to sell arms, appease Israeli interests and ensure aggressive anti Iran stance. 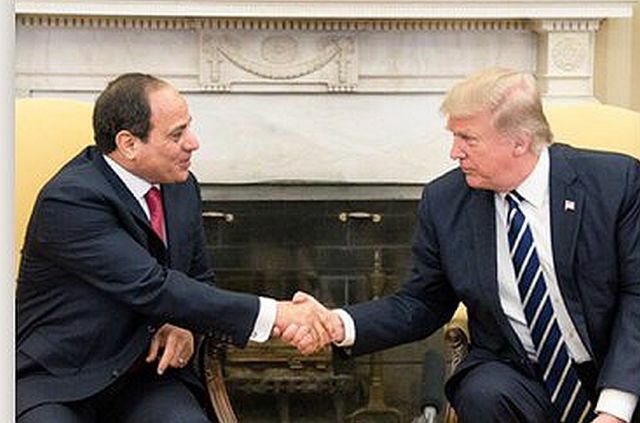 Whilst the May 20th Donald Trump visit to Saudi Arabia is significant for the kingdom, it was equally as significant for the countries in the coalition such as Egypt. During the visit President Abdel Fattah Sisi of Egypt was accorded prominent access and exposure. This is significant to Egypt because US and Saudi Arabia represent significant strategic, economic and security advantages. Strong ties with the Saudis and the Trump administration gives Egypt upper hand in the region particularly over its rivals Ethiopia and Sudan. These developments raise many significant questions. Who are the winners or losers? What does winning mean in this case? How will it impact the future of the region? Is it good for the stability and peace of the region? How about the economy and security of the Red Sea etc.? These are significant life changing questions for countries in the region with global implications. However, the mainstream fake-news international corporate media chooses to ignore these realities to perpetuate old and dead narratives that suit their dying agendas. It is therefore important to present perspectives reflective of the realities because these are strategic moves with long term impact to countries in the region. During the Bush administration’s war on terrorism, on every turn, Saudi Arabia, Egypt and Ethiopia sided against Eritrea. Counter to Egypt’s national interest, Hosni Mubarak allowed Ethiopia to dictate regional terms and supported the regime-change agenda that US and Ethiopia pursued against Eritrea. Saudi Arabia followed the same path against Eritrea. After Djibouti claimed Eritrea attacked its troops, Saudi-led Arab league conducted emergency session and condemned Eritrea without fact-finding effort. In a concerted effort, Eritrea was vilified as a destabilizing actor and sanctioned. Both Saudi Arabia and Egypt worked against their national interests by acting against Eritrea. They bet on the regime change agenda and assisted US and Ethiopia because they assumed Eritrean demise to be imminent. The fall of Eritrea was supposed to give rise to Ethiopian dominance of the region and perpetuate US hegemony of the Red Sea with client states Saudi, Egypt and Ethiopia as bulwarks. The agenda failed. The no-war no-peace agenda that was designed to suffocate Eritrea backfired and the opposite came true. Today, the minority regime in Ethiopia is in tatters. Ethiopia is beset by civil unrest and rebellion throughout. As a result, the country is on lockdown on a declared indefinite state-of-emergency. Ethiopia’s playbook depended entirely on US – Ethiopia relations whereby the minority regime served as boots on the ground for US efforts in the region and as center of African diplomatic hub where the US can reach-out to all its Africa related diplomatic maneuvers. What US Eritrea-regime change agenda failed to account for was the resilience, patience and strategic geopolitical moves by Eritrea. 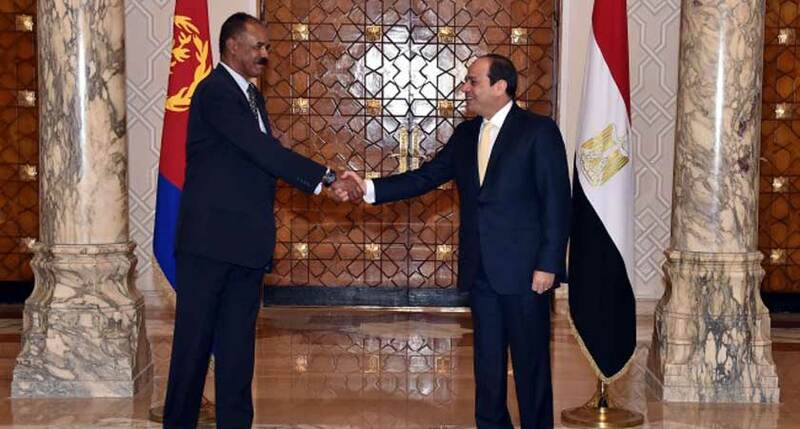 As Egypt went through rapid changes, Eritrea kept cultivating relationships with Egyptian authorities based on economic, strategic, regional and bilateral security interests that placed the Red Sea on the forefront. As Ethiopia boasted about the Nile Renaissance Dam, Egypt grew increasingly worried that the dam could ultimately impact the flow of the Nile to Egypt. This threat led Egypt to reassess its national interest and ultimately changed how it dealt with nations in the region. Immediately after he came to power, President Abdel Fattah El Sisi strengthened ties with South Sudan, Uganda and expanded relations with Eritrea. For Egypt, Eritrea is of utmost strategic significance. Hence, correcting Mubarak’s strategic blunder and creating mutually beneficial bilateral relations with Eritrea is imperative. As for Saudi Arabia, after the Kingdom started it’s bombing campaign in Yemen, Eritrea’s strategic importance became indispensable. The border between Saudi Arabia and Yemen is straightly aligned across Port of Massawa on the Red Sea. Unfriendly Eritrea could hamper Saudi efforts in Yemen. Hence, the Saudis were forced to reassess their relationship and security priorities and as a result bolstered ties and signed agreements with Eritrea based on mutual interests that focus on the security of the Red Sea. Peaceful Red Sea where all stake holders play key role based on mutual interests is critical. The Red Sea is a critical waterway for global trade and security. Relationship between Saudi Arabia, Egypt and Eritrea are natural and should have been automatic. However, US geopolitical agendas overshadowed the relationships to the detriment of the interests of the countries at play. 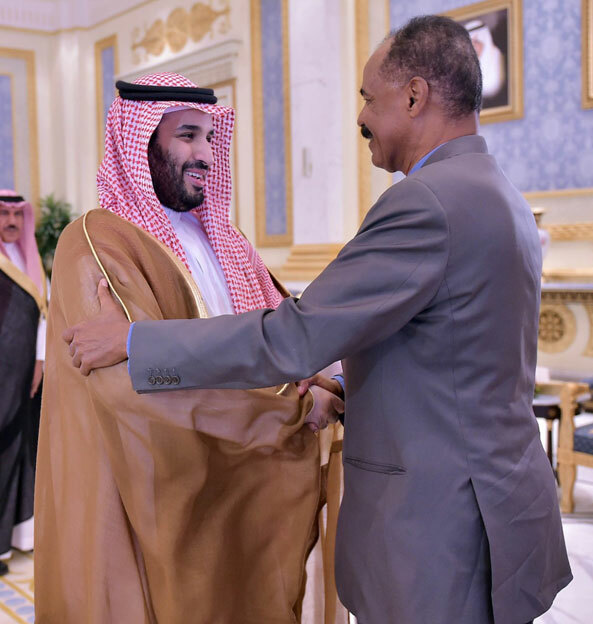 The moves by Saudi Arabia, Egypt and Eritrea are based on national interests and the unintended consequence is that it killed US and Ethiopia’s anti-Eritrea agenda. Ethiopia’s minority regime is the biggest gambler and as such loser of the region. The TPLF – EPRDF minority regime bet on US support to assert complete dominance of the region. The regime believed US support to be invincible and everlasting. It also believed the only country on its way to full dominance is Eritrea. Hence, all its efforts are dedicated to destabilizing Eritrea. Ethiopia, aided by successive US administrations and as a host nation to African Union, has been exploiting the AU to direct African political agendas of the region to suit its anti-Eritrea agenda. Intergovernmental Authority on Development (IGAD) is made up of eight-member states from the Horn, East Africa and the Nile Basin. IGAD was set up to serve the interests of the region. But Ethiopia has managed to control, (IGAD has been chaired by Ethiopia since 2008) and exploit it to forward agendas that favor its interests at the expense of others. Ethiopia spent billions on diplomacy, human, material, military and economic resources against Eritrea and failed. Its efforts may have created temporary challenges but it never stopped Eritrea. To the contrary, Eritrea is on a much better diplomatic, political, strategic and economic platform while Ethiopia is on a downward spiral. Like Ethiopia, Sudan is on slippery political, diplomatic, economic and military grounds. Sudan occupies major real state on the Red Sea and as member of the Nile Basin countries, Sudan strategic role is critical. However, since he came to power in a coup in 1989, Omar Al Bashir has played significant role in weakening Sudan’s position. Every time Bashir felt western-pinch, he acquiesced to demands that weakened Sudan’s important strategic role. In 2005, Bashir signed the agreement that split Africa’s largest country to two. In 2011, Bashir assisted NATO and played important role in the bombing of Libya and contributed to the chaos. Very recently, Bashir’s compromised and supported US role in South Sudan (SS) to get out ICC and of US sanctions. Bashir always makes his moves from shaky grounds and not necessarily for the national interests of Sudan. Friendly Sudan is a lifeline for the minority regime of Ethiopia. Ethiopian regime uses Sudan as buffer zone from rebels and most importantly Ethiopia wants Sudan on its side against Eritrea and Egypt. To that end, Ethiopia gave Bashir large chunk of its fertile land as border settlement. Bashir’s co-dependency on the minority regime in Ethiopia is based: A) Because AU headquarters based in Ethiopia. Addis Ababa gives Bashir the platform to fight isolation and the ICC with Ethiopia’s lobbying help. B) US-Ethiopia relations that the regime exploits to blackmail Bashir with hopes of US policy change on Sudan. As a result, Bashir consistently supports Ethiopia’s position as in the case of the Renaissance Dam. Ethiopia and Sudan have signed various bilateral and security agreements. The symbiotic relationship between Ethiopia and Sudan makes Egypt uneasy particularly as it relates to river Nile. Egypt and Sudan share a huge border and their relations have been tensed as a result. They constantly accuse each other for meddling. Hence, there are no neutral actors as it relates to the Saudi led gulf coalition against Qatar. Sudan tries to appear neutral and states that it stands by the Kuwaiti mediation efforts. However, Sudan’s aim is to weaken Egypt’s position and role. No matter how it is portrayed the Saudi led effort against Qatar is regime change agenda at work. The Saudi’s were not keen on Qatar’s role in many countries and unhappy with Al Jazeera News Network. They saw it as nuisance and impediment to their dominant role in the region. Egypt is also one of the countries that consistently complained about Qatar’s subversive roles, support of extremist groups and consistent anti-Egypt propaganda using its media. Egypt and Qatar’s relations have been tense going back to 1997. For long, Qatar played instrumental role on events that determined the fate of Libya, Syria and others to the detriment of the future of these countries. Qatar was on quest to assert dominant role in the region and beyond. In the name of peace and security, Qatar has been involved in Africa and Middle East extensively. The Doha Document for Peace in Darfur (DDPD) was agreed and signed in Doha in 2011. The Eritrea-Djibouti mediation effort is an example of Qatar’s involvement in the region. On June 14, 2017, Qatar withdrew its peacekeeping troops from Djibouti siting Djibouti has downgraded relations. This move stirred international hysteria largely based on Djibouti’s lies. Djiboutian authorities outright lied to the world that Eritrea is occupying land that Qatar vacated which they were forced to recant as there were no evidence. Djibouti’s motives are clear. Djibouti depends on Ethiopia for its income of port dues. Djibouti has vested interest on the conflict between Eritrea and Ethiopia because it perceives Eritrean ports as competition and thus a threat. The rift between Qatar and the Saudi led coalition provided an opportunity for Djibouti to escalate the situation, pull France and Ethiopia but failed because African Union rejected Djiboutian lies and Ethiopian ploys. Ethiopia and Djibouti are trying to spin the events with lies. The reality however, is 1) Qatar has officially informed UN that it withdrew its forces because Djibouti expelled its ambassador. 2) Qatar also informed the UN it is still committed to the mediation. Within the context of the current geopolitical developments in the region, considering the determined hostilities she faced, Eritrea is the biggest winner and benefactor. Eritrea was slated for isolation, regime change and to become a failed client-state for Ethiopia. Sudan, Egypt, Yemen, Djibouti, Saudi Arabia and Ethiopia were once on the same side serving greater US interest and worked to destroy Eritrea. A) Eritreans fought these challenges collectively as one. Eritrean resolve is hardened by decades of experience that no ploy can nudge. As result, the sanctions, the isolation agenda and all the vilification campaigns failed to change the situation on the ground because Eritreans understand their national interests and did not budge. To the contrary, most of the countries that worked against Eritrea are facing tumult and instability. Absent of new direction, Ethiopia is doomed to become a failed state. Yemen is a failed state. Egypt is on difficult path. Sudan is facing further breakup and instability etc. B) For Eritrea, the Red Sea is the most important lifeline as it is for Egypt, Saudi Arabia, Sudan and others. Eritrea’s position is based on the premise that all the actors that share the Red Sea waters to play their due role by cooperation. Eritrean resolve and strategic approach was steady, methodical, strategic patient and effective. And it paid off because for the first time, the nations sharing the Red Sea waters are working in concert for their national interest, not the interests of Western powers. The cooperation agreements between Eritrea, Egypt and Saudi Arabia provide welcome start for regional growth and partnerships to benefit the region. The implications of Qatar – Saudi rift to the Horn of Africa is quite evident. 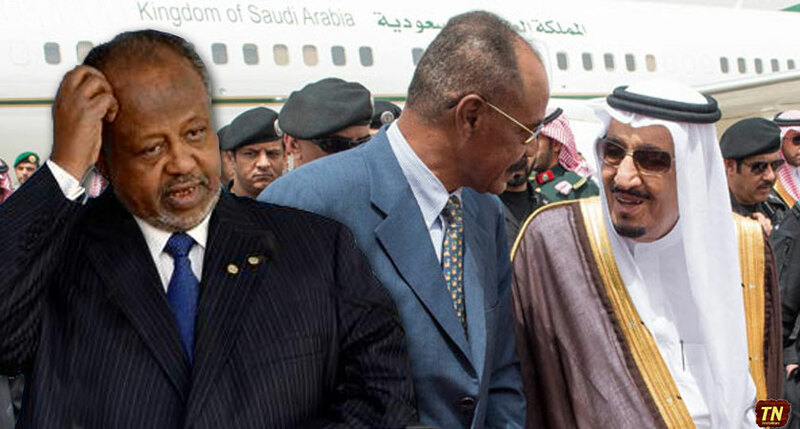 The alliance between Sudan, Ethiopia and Djibouti vs Egypt’s alliance with Saudi Arabia has created renewed tension. At some point, Sudan and Ethiopia must come to terms with the realities on the ground, accept it and work with it. For this to happen, the minority regime in Ethiopia needs to embrace Eritrea and Egypt’s concerns and address it peacefully which is not on the DNA of the regime, unfortunately. Saudi Arabia and Egypt are determined to ensure Qatar’s position is weakened. To that end, they want to see all the countries in the region side with them. Sudan is being urged to take a firm stand on the situation. Ultimately, Sudan must take side. Not siding with Saudi Arabia will have serious consequences for Bashir who is surrounded by the coalition. Siding against Saudi Arabia, Egypt and allies will threaten Bashir. And if Bashir choses to side with Egypt and the Saudis, the Ethiopian regime will be isolated. The minority regime in Ethiopia is the odd man out. Ethiopian regime has played all its cards and lost. The people of Ethiopia have rejected the regime. Hence, the rightful owners of Ethiopia must take power and make peace with countries in the region. If the regime in Ethiopia insists to hold on to power, Ethiopia faces extremely dangerous instability. These are the realities facing the region. For regional peace to prevail all the actors including Sudan must work to change the political dynamics in Ethiopia. In Ethiopia if the minority regime didn’t give the power to real Ethiopians it will be worse than Yemen.We should prepare for that with the help of Egypt,Saudi Arabia and UAE. I think if the Ethiopians can put their act together, they could do it by themselves without depending on Egypt, Saudi Arabia or UAE. They just have to do their homework and pass the test. I agree with you. The rational thinking for the Ethiopians to do is to fully and unequivocally ACCEPT Eritrea’s sovereignty and INSTEAD of salivating the dream of reoccupying it. reoccupying eritrea for what????? tell me my friend??? for what???? for its fertile farm lands?? for its oil??? for its ports?? for more trouble??? All we need from ur country is not to make noise and to stay away from our journey toward peacful and wealthier Ethiopia. There is NOTHING Ethiopia gains from reoccupation. NOTHING! How did one of the fables in the Aesop’s Fables go?… and when the fox couldn’t reach the grapes after many attempts, in frustration it shouted: “THE GRAPES ARE SOUR!… THE GRAPES ARE SOUR!”. ……how about this, do your home work and get rid of the cancer of the horn of Africa, and then your ppl will see the light of hope…if u cant pass this test, shut up and sit down. Because, u are in no position to talk about other countries. Mr. Wedi Tigray, what kind of crazy Questions you brought up today ?…. hmmm you must be on pills or something. -125, 000 Ethiopian (99% Amhra and Oramo )soldiers destruction. – No war no peace self destructive policy. – The failed isolation policy. – Fully fabricated unjust sanctions. – Day and night tireless and boring smear campaigns. – Officially announced Regime change agenda. – Illegal occupation of sovergien land against International law. All of these futile efforts have done for NOTHING by your “definition”. Yes I will say it again. U started the war, u lost the war. I didnt say that, the UN did. I am not going to argue with u about the consequece of the war. The whole world knows who lost big. Your country is destroyed, isolated, sanctioned and frozen in time for decades now. But one thing I would like to mention is that, Ethiopia is not comming unless eritrea does stupid. Forget assab, we have way better options. We dont even need it. U can have ur camels drink water from it. Sad but true! why don’t you answer this question first !! !Miss Sentiko/sheger addis/ Ethio/Balance/My thinking / dan / A Hero from Amhara .Why 15 million really Ethiopians are starving?? Delusions of grandeur at its finest…. You realy made me laugh when u said u are amazed by how shabia does things. Realy u made me laugh! …..the way I see it, shabia couldnt even get Badme! shabia is silenced so much that they couldnt even get what is actually awarded to the country. Forget about Sudan, Yemen and Ethiopia…. it is in no position to play like that ! Brother, you realy dont know what is going on in politics, do u? go feed those kids first ok!!! Wedi Desalew (aka the Donkey slaughterer) said he wanted to help [unless he is not joking] ….. the last time he tried one, he ended up with an Arab force setting up a permanent military base at its door step – in three directions. His recent meddling in the internal affairs of Djibouti will only complicates the matter and that may eventually borne or speed up the idea of an Egyptian command post or a possible UAE – Saudi force at the common border between Eritrea and Djibouti. I’m sure he ain’t like that. The situation in this region is so fluid and may get out of his control anytime again. We advise him to better mind with his ailing economy and the 9 million starved people …. A lost soul he better stretch his hands to his Western masters for alms to the dying millions instead playing regional police. In writing, there is an important term called “Framing”. What does it mean? For example, a political writer or a cadre whose mission or responsibility is to write a supportive essay, statement, opinion, etc., He or she should put a framing first. Let us consider A. Biedemariam’s article as appeared here. His framing is as follows: (1) The Government of Eritrea policy on the bilateral and multilateral relationship (in our broader region) is careful, the best, independent, qualified, etc. (2) Generally, those of our neighbors’ are not. This my way or the highway approach can cost us a lot that could be prevented or averted. Based on this framing here is his essay or a short article for us to read. I am sorry that this article does do very little service to the ongoing Eritrean political and socio-economic strategic and tactical maneuvers. Rather, it might be detrimental for the mathematics of politics in our delicate broader region. Relax. Amanuel’s article is just an opinion piece. He is simply interpreting events in the neighborhood adding his own guess/forecast of what the outcomes will be under different scenarios. He is not declaring a government policy nor discussing a government policy. The crime of Desalegn’s “Donkey slaughterer”in Woyane Land is known as Domestic Violence. The Chairperson of the AUC announced on 3 July 2017, during the 29th Assembly of Heads of State and Government of the African Union that an AU High Level delegation led by the Commissioner for Peace and Security, Ambassador Smail Chergui will travel to Asmara, Eritrea to discuss with the authorities of Eritrea the developments in the region, and also exchange views on the AU’s initiative to develop a Horn of Africa Strategy. 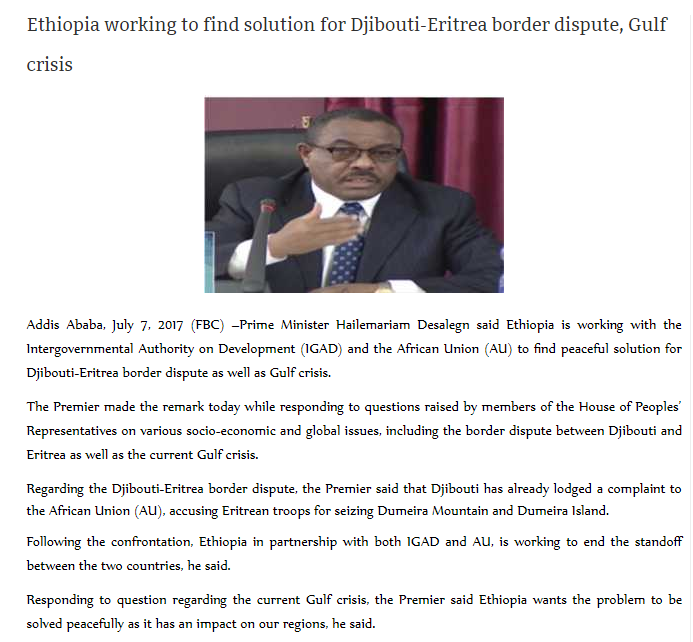 That sounds like Eritrea has taken a preemptive measure to make sure that the Eritrea-Djibouti border issue is NOT handled by AU. AU is a weak organization that can easily be manipulated and employed to defame and blame Eritrea and eventually transfer the matter to the UNSC where Ethiopia is a temporary member. This approach has been used before and not going to work this time. Eritrea will not allow the AU involvement and would not scratch the mediation made by Qatar. It would persist from where it stopped by replacing other forces that are more friendly to Eritrea. 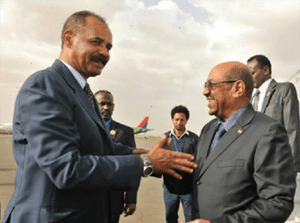 Furthermore Eritrea may consider making a military and security agreement with Egypt and provide a military base that includes an effective Air Force. This provides a deterrence from any military adventurism from south and in fact will force woyane to resolve the boarder dispute according to Algiers agreement as it realizes that no option are left for them to maneuver. Eritrea is taking time to find a replacement and kick AU to the curb. If Saudi, UAE or Egypt volunteered to replace the Qata forces, Djibouti has no option but to accept it as not to compromise future Arab league support and significant port investments by Saudia. Now, where is Hailemariam’s leverage? Hailemariam’s leverage is in the 100+ million brave Ethiopians…so go make your deals. In your case, large population actually is a liability not an asset. You can not even feed them without handouts. He is a confused soul he spiced up the figure he meant only six million the others are the real Ethiopians who are the legitimate owners of the nation state. Is it the 100+M, who are ready to slice him to pieces, like k’tfo- meat? I know it is your wish, but it ain’t happening…. Is that why there is state of emergency on 100+ million brave Ethiopians? How could you reconcile your claim of “leverage” and the situation in your country. go feed those kids first !!! In fact, AU should not be allowed to be involved in any mediation effort until it addresses the Badme issue. If and when they come to Eritrea they better be prepared to condemn Ethiopia’s occupation unequivocally and recommend for an action by the UNSC. Nothing could be further from the truth. Agreed. My conclusion from this article is that Saudi Arabia is going nuts from the fear of being undone by Iran and, hence, is blindly striking in every direction possible. It appears the tenacity of the Shia Houthis of Yemen scored big in the psyche of the despot king of Saudi Arabia. But Saudi Arabia is to blame. 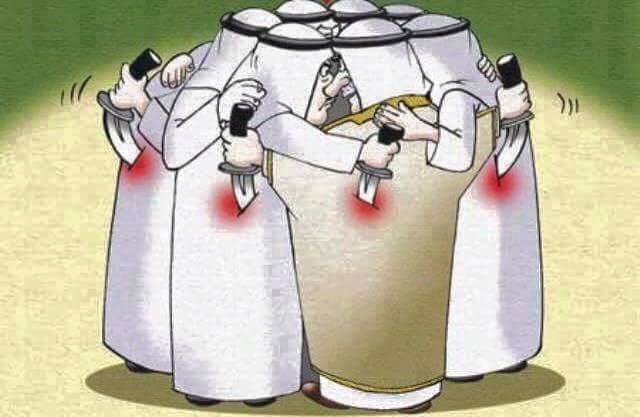 Executing a leader of the minority Shia in Saudia only made the pot thicker. The Shia people of the region were enraged. Of course, Al Jazeera was there to spread the news. As far as the relationship of the minority TPLF-led government of Ethiopia and Eritrea is concerned, the best bet should be the possible rapprochement to come after these “HASADAT” (parasites) are removed from power and the real Ethiopians (the majority Oromos and Amhara) regain power in Ethiopia. @AzA3i3 : Essentially, the Saudi and US govt were only supporting Somalia so that they can get closer to Ethiopia. Can anybody name ONE single crisis in Africa solved by the so called AU itself ? In fact, AU is good at complication things on the disputes that already exists to get more financial aids from the international community. Yes I can name one: NONE! The DNA sharing group of regional royals need to place country above self and think long term global benefits, if only for their own future relevance. This article signals their internal bickering leading to their self destruction. The only thing that i don’t hold against sudan is the fertile land bit. I mean what goverment would not give in to so much fertile land. That shows how weak of a state the minority regime is in. The fact that they would give away so much land in a closed door meeting to hopefully pull sudan to its side over that dam. The whole reason was because they disrespected meles at some meeting now 10’s of years later amhara land is compromised for meles ego hahahhahaha. Did Eritrea cut ties with Qatar? If not why did qater leave? I kno Djibouti cut full ties with Qatar but what about Eritrea? Eritrea and Qatar neither cut nor downgraded their diplomatic relations. It’s only that Eritrea was not happy with some of Qatar’s past behaviour that we saw the signs tat lead to the cancellation of Qatar flights to Asmrar. When Eritrea got the oportunity to play even, it just sided with those who are against Qatar. So it’s up to Qatar to cut or downgrade its relation with Eritrea, not the other way around and unless Qatar play dirty against Eritrea, we are not going to call the shots. I think that is obvious. One last note, please refere to the Qatar foreign ministry press release. 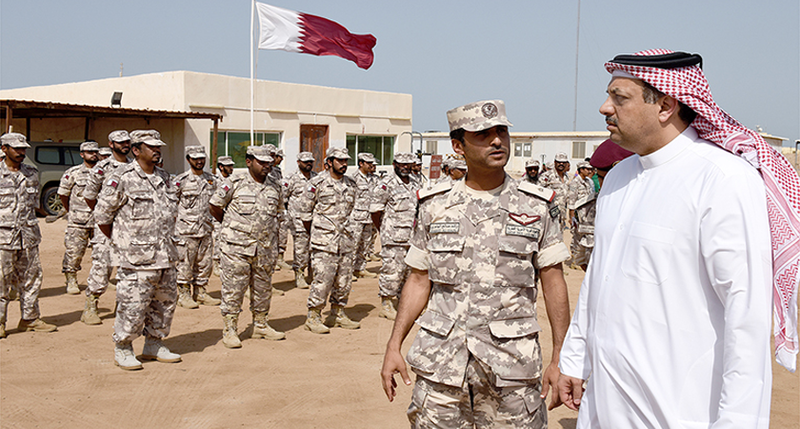 It clearly states, Qatar pulled its troops only from ‘the Djibouty side’ due to the later cuts diplomatic relation. I hope this explanation will help. I bet you must have mused and loooled when you saw this dimwit’s answer!!! weche good!!! You know I love to abuse every Ugum who don’t belong in TN & especially those that keep coming to waste out time. ቍልፈ- ነገሩ እዚህ ላይ ይገኛል! Oh men exactly!! Nice 100%!!!!!! Exactly the same thing that the Qatari foreign minister has been repeating in the past few days. Did you understand what this IQ 63 is blabbering about. He is wearing the regional security analyst jacket right now, albeit from the Dedebit point of view. Do these people forgot that they don´t have even a junior role to play when it deals the security of the Red Sea, it matters only those littoral countries by default the MLLt lead mamma Ethiopia is out of the game, the only thing they ha left with is sit on the platform and watch the game. LOL, Woyane’s Red Sea Security is through Powerful Binoculars donated from North Korea. Nebsi, GhenZebka, than you too. Mozaza, your argument makes sense to me cuz that’s exactly what started the 98 war. We said enough, he started to attack as if we owed him something. This time Qatar lost revenue flying to Asmera like Ethiopia in those days, he just made a decision to get even with the only friend that was feeding him. It does explain the behavior. We were sitting there scratching our heads but let me ask you one question please, do you people ever wonder if Wedi Afom has been wrong all along or you think he is the second coming himself? We ( B.Adal, Meaza, or any TN member) have no expired food to give out, so YIRDEAKA. The ultimate answer to the incessant question of engagement in abortive discussion by multitude MLLT Zombies is as you have rightly wrote is: YIRDEAKA it is a magic word and it functions. Meaza Eritrea did not side either way ti simply said Qataris problem is not limited to qatar that means it includes all other arab countries are support ing as well. I can’t believe my ears. Did Hailemariam Desalegn actually say this? Wooow. This shows how much he is disgusted by the regime he nominally leads. It is edited to insult Woyane. The original video is actually about an interview he gave during new year, what new year means to him, bla bla bla. In his original interview, he as usual was bashing Eritrean government while bragging woyane’s force. Regardless, the host did a good job to make it look real and funny. Finally, … although it is edited, Halemariam Desalegn’s thinking is not far away from this edited version of his interview. Mr Dessalegn has not choice other than to lend his mouth to the MLLT hardliners he doesn´t own his words he neither has his own opinion or else he knows the alternative, that is how it worked in the land of double digit while millions leave on hand outs, middle income country by 2020 at the same time deeply indebted. Ethiopia under the brute rule of MLLT could not even service its colossal debt ( around 40 billions USD they need to pay more than one billion yearly ) from its exports earnings alone they have a deficit of some 400 millions USD on annual bases. But they love to come up with bombastic remarks specially those Dedebit trained cyber warriors just to ” show ” to the outside world they are growing by leaps and bounds. However, in reality they are sinking in a debt trap the only way out would be cancellation of debt as it has happened before, at least those owned by multilateral ones. The MLLT modus operandi is so knotty may be no one understans it even its authors. It may be is the point. or without the help of its Arab allies) to repulse Ethiopian full fledged attack? What do you think Ethiopia was doing for the past 50 years? 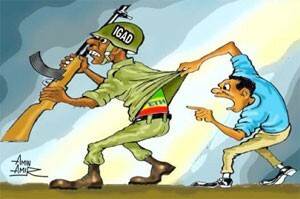 Not alone, but with the support of every country willing to help Ethiopia, they have tried to subdue Eritrean. Year after year, they have failed miserably. Your question is not a hypothetical; it is a real question that have been proven with clear answers, many times. Woyane has been promising Amhara to take Assab back, they have been promising the state of ugumesh to overthrow ShaEwia, … is it only a propaganda similar to their DOUBLE DIGIT “economic” growth. If you have a rope around your house, ask yourself what the mighty (lol) Ethiopia has chosen (hypothetically) not to be landlocked? The MLLT lead Ethiopia has tried it with out fruition the last 15 years, the two callous previous regimes have tried their level best but to no avail. All this with direct or indirect blessing of the powers to be near and afar. If the MLLT gangs had the possibility and the means to do so, they would not have hesitated for a second but they badly lack both the know how and the means, there lies the answer. The MLLT assemblage are struggling for its own survival and getting strangled increasingly by its own design, the so called “no war no peace” policy – the once cherished Weyane mantra. However time is changing and the pendulum has swung to the opposite side, little did they know time is dynamic but in the MLLT formula it had no rum. They had to rely on their calculation towards Eritrea on the assumption that every thing remains unchanged in some disciple called-: ceteris paribus. B Adla, The question was serious question asked to the writer of the article. Instead of trying to answer the asked question , you spent your time writing mumbo jumbo. Give it a second try, but this time try to use your own brain and stop being foolish..
Go get something to eat, may then you will understand my earlier generous responses. My response should have been YirdeAka!! This is the procentage of population in Somalia(including Djibouti) each clan. Hawiye is majority clan in Somalia with 35%. Followed by Dir with 31% and Rahanwiin at 20%. Darood is minority with 10% and others are 4%. Hawiye can kick out Farmajo from Mogadishu in one day. Dont sit here and spread your stinking Darood lies. Gaalkacyo is a Hawiye city.